The acoustic North River Band will be featured at the Friday, July 29 Music On The Square concert in downtown Rochester.. Underwritten by Federal Savings Bank and a grant from the NH State Council On The Arts/National Endowment For The Arts, the Music On The Square Concerts are held on Fridays from 11:45 am until 1:30 pm through August 26. Concert goers are asked to “bring a chair and buy or bring a lunch” to enjoy a musical performance in the heart of downtown Rochester. North River Band performs as a four piece acoustic group as well as a 6 piece band with the addition of our drummer and keyboard player. We are from the Portsmouth New Hampshire area. The band has a classic three part harmony sound that we bring to the current and vintage pop and folk songs we cover. The vocals are backed by guitar, bass and additionally keys and percussion. North River Band's music is perfect for venues wanting live background entertainment for receptions, dining and private parties. 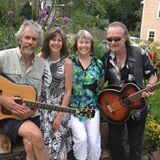 We play at a wide range of venues from outdoor festivals like the Stratham Fair and Newburyport Yankee Homecoming to smaller indoor settings at local theaters and at house parties. The Music On The Square Concerts are held weekly through August 26. In case of inclement weather the concerts are cancelled at 10 am. Free parking nearby is available at the North Main , Union, and Congress Street Parking lots. For more information please contact the Rochester Main Street office by calling 603-330-3208 or email director@rochestermainstreet.org. Appearing on Friday, August 5 will be Linda Pouliot . Don’t forget our Wildlife Encounter at 12;00 on Wednesday, August 10 in Central Square. There will be activities and games for all!